Kiri’s Clown was a healthy, strong 25. His going was nothing short of a rending shock. When he colicked on Monday, he got the best possible surgery from Dr. Scott Hopper at Rood and Riddle, and it seemed he would recover. We hoped to have him with us for a long time. But Kiri succumbed to complications following the surgery. 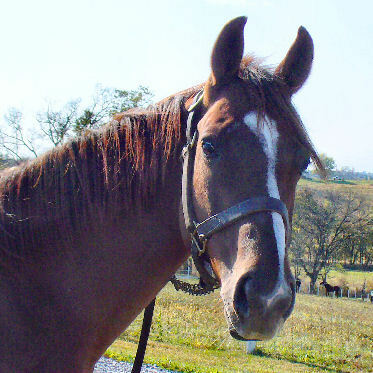 Bred in Florida by Gardner F. Landon & Mary A. Sullivan, Kiri’s Clown was raced as a homebred by Cobble View Stable and Sulimar, trained by the legendary P. G. Johnson and ridden by Mike Luzzi, Jean Cruget and others. His wins earning more than a million dollars, and the multiple speed records he set, are recounted in the news release on our web site. Kiri’s Clown in his racing days. Photo by Laura Battles. Kiri’s Clown was consistently good through his entire racing career. In the breeding shed he made his mark too, as the damsire of three-times G1 winner Get Stormy, who now stands at Crestwood Farm in Kentucky. The public achievements of Kiri’s Clown are indisputable, but they may not be what his visitors in retirement will remember best. Kiri arrived at Old Friends in August 2006, a month after I began volunteering on the farm. 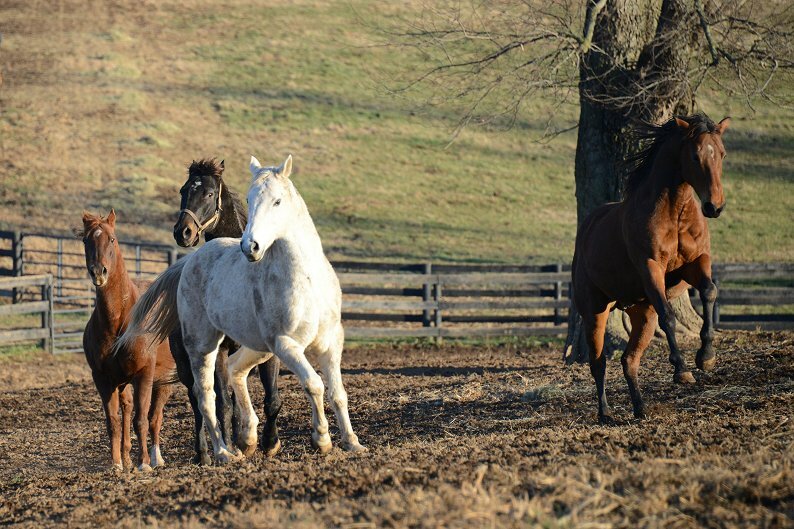 Some horses settle in at once, others take longer to get into the pleasures of retired life. At first, Kiri didn’t really want to step down. One of the first things he did was manage to get his paddock gate off its hinges, and for the next week or two he kept hoping he could do it again. That first month, he spent a lot of time just staring into the distance. “What does Kiri’s Clown want?” Michael asked Jean Cruget, who’d ridden him as a youngster. Jean shook his head. “Speed, speed and more speed,” he said. Doing Saturday tours, I’d try to get him interacting with his visitors. “Earth to Kiri!” I’d say, but he’d just accept the carrots and look into the faraway. Then, in September, everything changed. Awad came! Kiri took one look at his old racing rival, and leapt eagerly into the here and now. From 2006 through 2010, those two were engaged in the friendship neither of them would admit was a friendship at all, but it was one of the most intense on the farm. You can’t tell me they didn’t remember each other. Horses have better memories than humans in some ways, and the Sword Dancer wasn’t the only time Kiri’s Clown and Awad squared off against each other. On June 10, 1995 in the Manhattan Handicap at Belmont, Kiri set a blistering pace only to be passed at the end by two horses, one the winner Awad. On July 29, Kiri held off Awad’s shark-quick run in the Sword Dancer. Both shipped (together? I wonder) to Chicago for the Arlington Million, where Awad won. Whatever Kiri remembered when Awad appeared, it gave retirement a purpose for him. One upping Awad could take many forms. 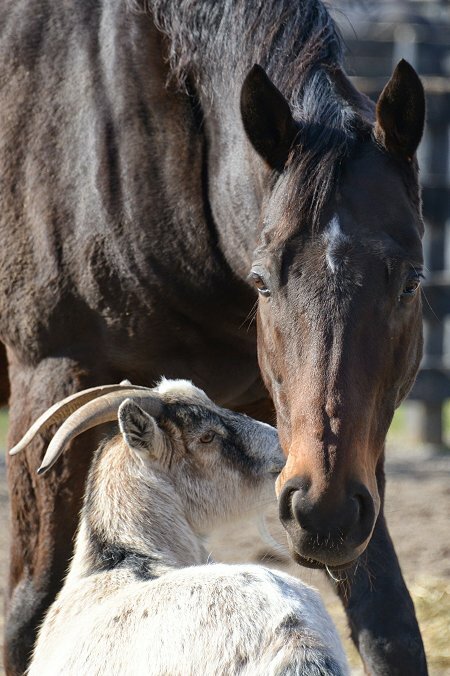 He could impress his old rival with his stallionly fierceness, he could vie with him for carrots, and whether the two wanted to admit it or not, they spent a whole lot of time just hanging out together, right across the fence from each other. When Awad died, Kiri went in his run-in shed and didn’t come out much for three days. Kiri’s Clown 2014. Photo by Laura Battles. But Kiri was a trooper. Life went on, and the interest and pleasure in retirement that he’d gained never left him. His name was probably inspired by a combination of his parents’ names, Kiri and Foolish Pleasure, but he rarely seemed a clown. I was always impressed by a particular innate dignity that he had, almost an aloofness, though he also had a definite graciousness. Something about him was refined, too, as if he were really, beneath the daily trivia, made of wind. The pure joy of a speeding wind. This should be a joyful season, but we have just lost two much-loved residents. This post and the next will honor them. I hope all who ever visited them, or watched them race, or played a part in their lives, will take a moment to remember two horses at opposite ends of the Thoroughbred spectrum, the G1-winning, record-setting millionaire Kiri’s Clown who came to OF generously supported by his former owner, Mary Sullivan, and the hard luck claimer A. P. Slew who came to us as an unwanted horse. The two faced differing challenges, and in each, his way, triumphed. Each deserves full recognition, so each will get his own post, in the order they left us. First, A. P. Slew, who passed December 21. The next post will honor Kiri’s Clown, who passed on December 22. A. P. Slew. Photo by Laura Battles. A. P. Slew was exceptionally pretty and his pedigree had much to offer, but physical issues discouraged buyers at the Keeneland yearling sale. So he raced for his breeders, the Allen E. Paulson family. Continuing to battle issues, he debuted at 4 years old at Hollywood Park, where he raced well but didn’t win. In fact, that describes most of his 56 races. He usually finished close to the front but won only 3 times. A. P. Slew didn’t lack talent or determination, but he was a bleeder. Typically, he’d be in strong contention, often on the lead, then congestion would impede him. Yet his tough will power earned him plenty of 2nd and 3rd place finishes. A. P. Slew, 2008. Photo by Karyn Pirello. Like many who drop in class, A. P. Slew eventually left the premiere tracks for lesser ones. A horse’s lot can be rougher there, especially if he or she is acquired by outfits that deserve their lack of success. 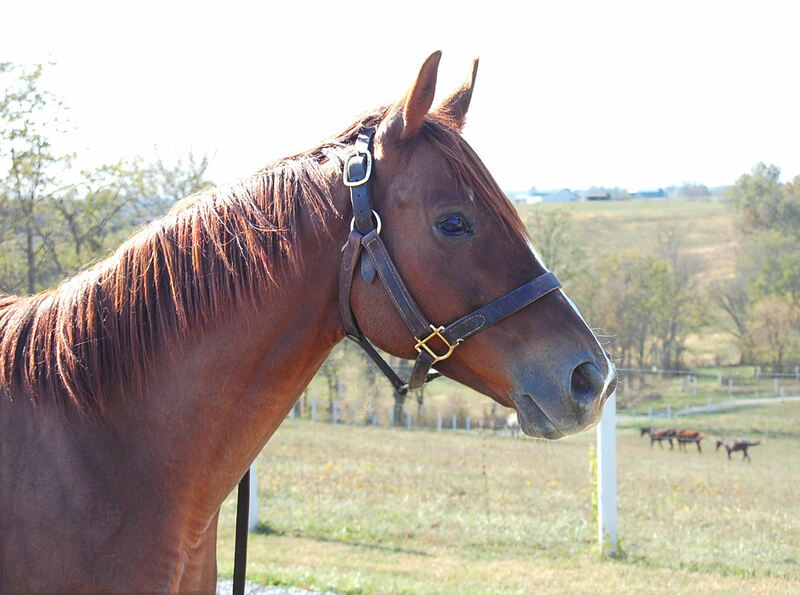 A. P. Slew’s last two racing years were grim and ended with a decision to send him to slaughter. Responsible, excellent horse people also work at blue collar tracks. A. P. Slew was lucky to be on the radar of one responsible person who networked with others, and A. P. Slew was bought out of danger. He’d beat the odds for the first time. The 9 year old needed a home. 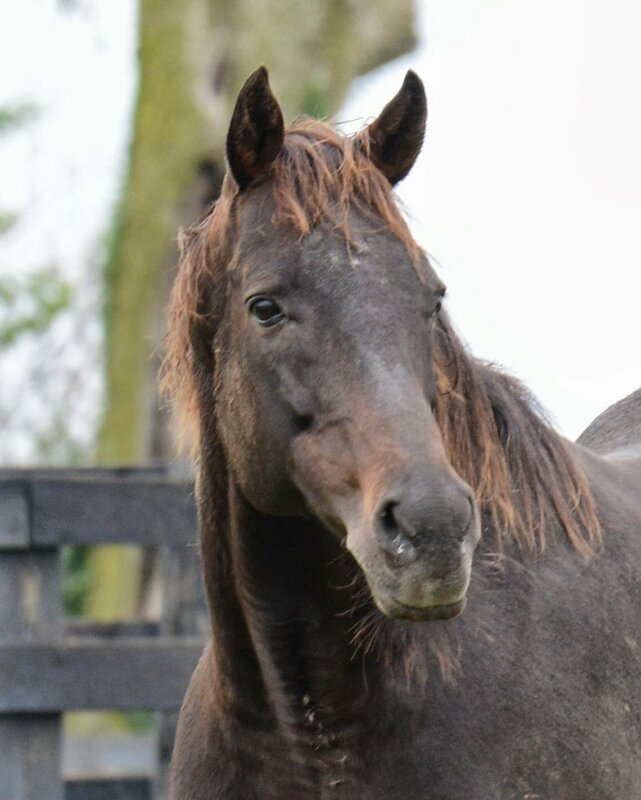 He went to the Kentucky Equine Humane Center, but two years of mistreatment had made him unadoptable. Being a self-respecting horse, A. P. Slew was no longer giving people a chance to hurt him. He was hurting them first. Adopting him out would have been unsafe. The alternative was humane euthanization. But KyEHC personnel could see the little red horse wasn’t vicious, just desperate. Given a few years of patience, he might learn to trust again. KyEHC called Old Friends. A. P. Slew had beat the odds a second time. 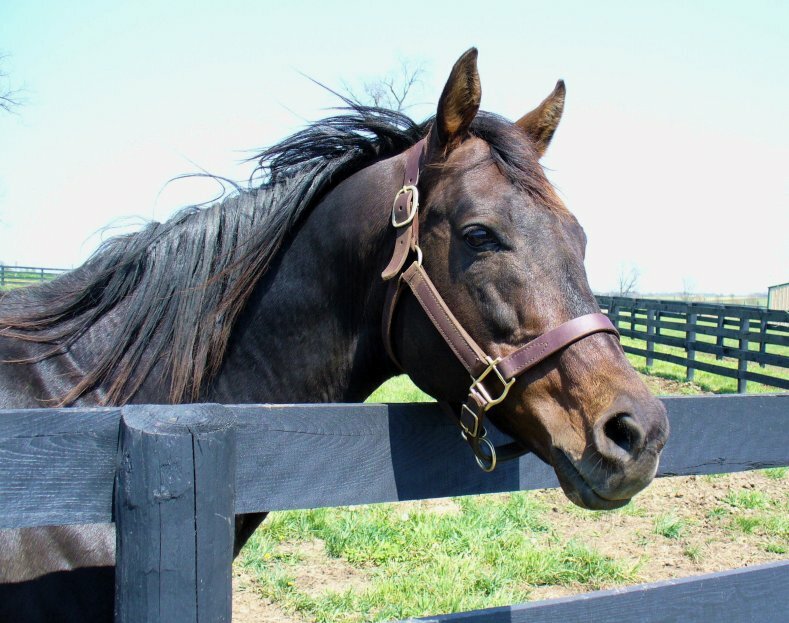 Not being ready to greet visitors at Dream Chase Farm, in 2008 he lived at our excellent satellite a few miles to the east where the very best of care slowly regained his confidence in people. His responses to affection could be a little funny, but he did respond. In his way, he blossomed, making friends with Hussonfirst as well as his caregivers and the volunteers who visited him in his quiet home. He became quite possessive of “his” particular humans. A. P. Slew was not quite sure about us yet. 2008. Then EPM struck. Equine protozoal myeloencephalitis is a parasite that can cause neurologic deterioration. Despite treatment, A. P. Slew nearly died. But he hung tough, and with encouragement from the people he’d begun trusting, he pulled through. He beat enormous odds for the third time. Recovery from the effects of EPM can be much slower than recovery from the infection itself. A. P. Slew never stopped recovering. 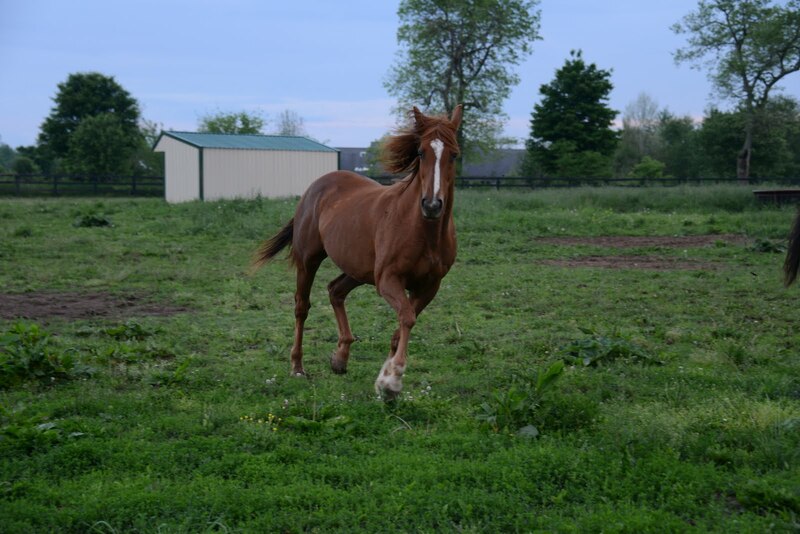 Moving to Dream Chase Farm and showing his sweetness to all he met, he also improved in coordination, eye sight and muscle tone. By the time he reached 15 he was nearing 100%. And at last A. P. Slew achieved the success that had eluded him on the track: He became the undisputed boss of his small herd. He loved it. He also enjoyed that paddock’s access to visitors. Especially, he enjoyed peppermints. But on the dark solstice at the end of 2014, A. P. Slew colicked. I won’t sugar coat it. He battled acute distress. But it was a measure of the goodness of his life at OF that when staff and volunteers hurried to his aid, he ran to them for help. We tried our hardest to fulfill his trust. He had surgery from the best at Rood and Riddle. But finally, the odds beat A. P. Slew. He was tough, though. Nobody ever struggled harder to make it, and it took persistent ill-luck four hard tries to take him down. I have known more successful race horses, but I have never known a horse more valiant than A. P. Slew. A. P. Slew – the good life, 2013. Photo by Laura Battes. 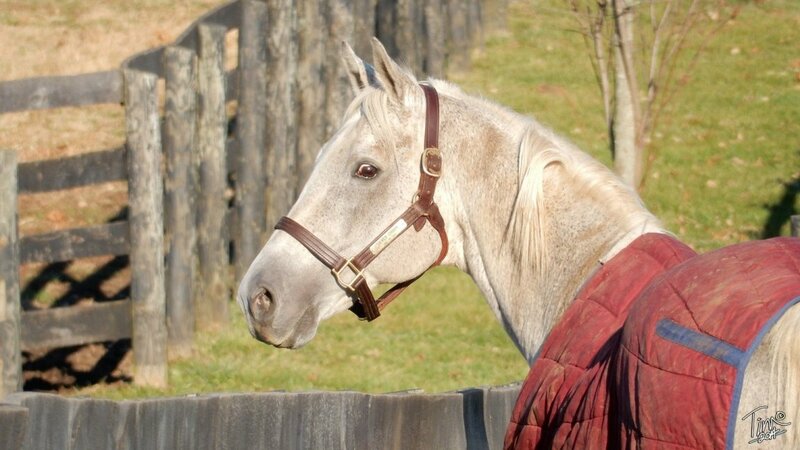 Silver Charm meets Michael the day he arrives, after his reunion with Sandy Hatfield. Photo by Laura Battles. 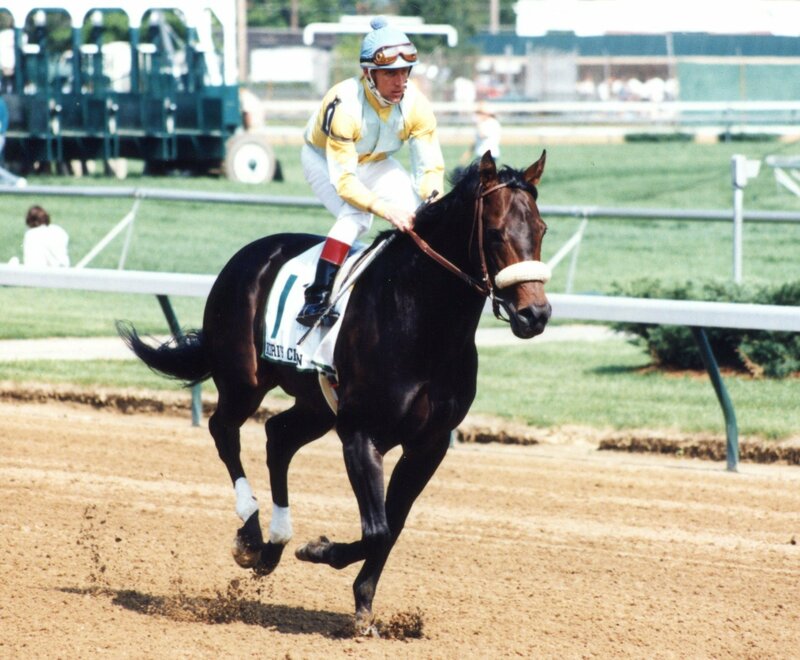 It was Sandy Hatfield, his groom when he stood at Three Chimneys, who introduced the 1997 Kentucky Derby and Preakness winner to Old Friends the day he arrived, and who joined him again the next day for his meeting with the fans and the press. 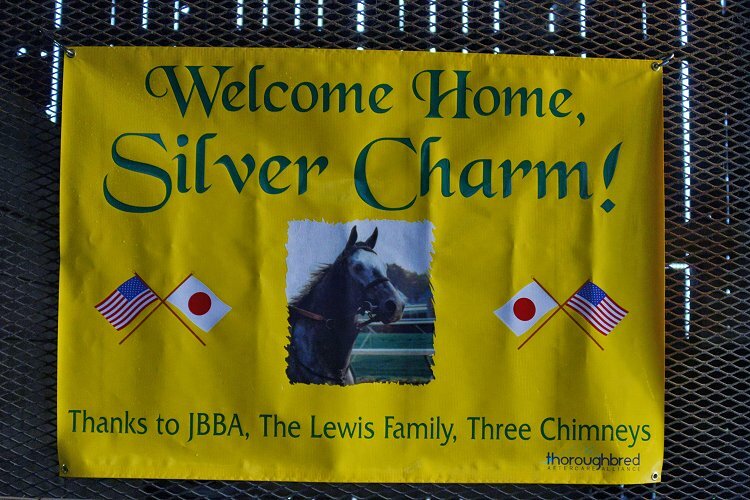 The cooperative efforts of the Japan Bloodhorse Breeding Association (JBBA), the Lewis family and Three Chimneys on behalf of this superstar’s retirement when his stud career was done are an exemplary instance of how we can all work together in the best interests of the horses who go overseas once they have finished their work toward the international development of the breed. It shows the best of worldwide respect for these equine athletes. And we at Old Friends are over the moon that besides getting to have Silver Charm with us, we’re getting the benefit of Sandy’s expertise. She’s now an Old Friends volunteer! 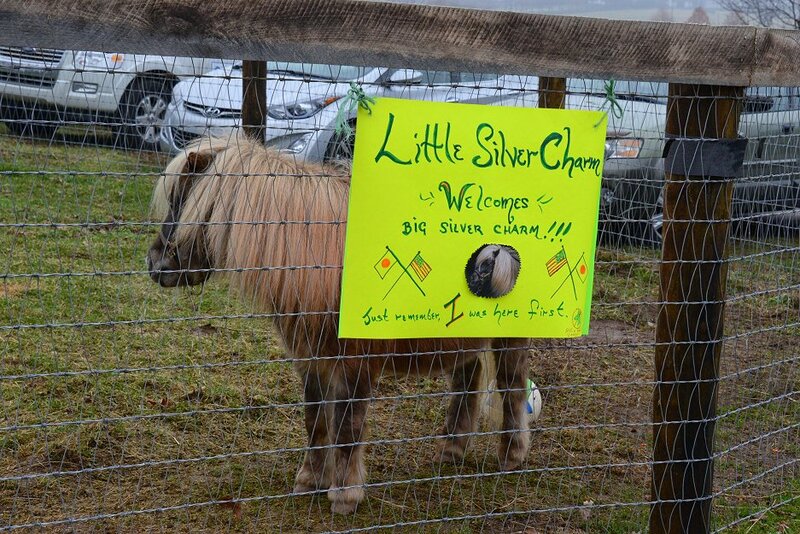 To be sure, Silver Charm may have wondered what kind of place this was at first when it did nothing but rain, but this week the rain let up and we even had some sun. 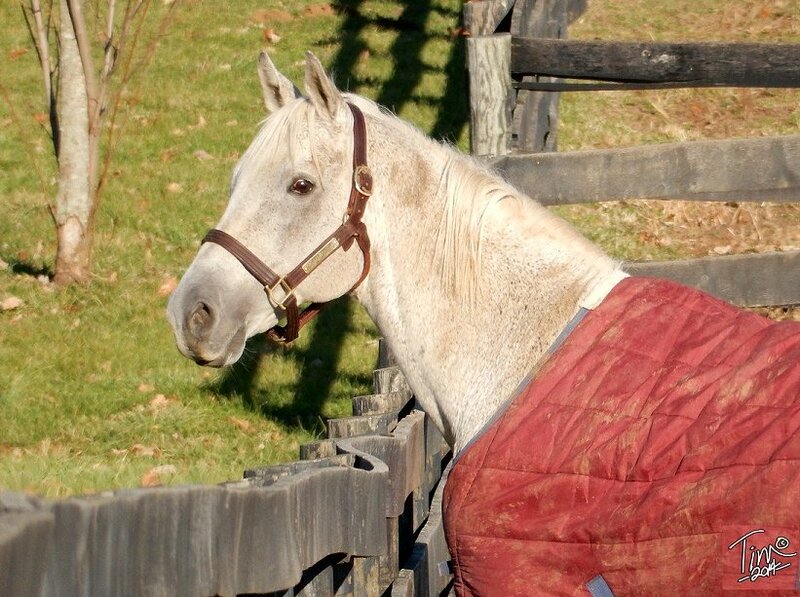 Temperatures in the Blue Grass have been fairly mild and Silver Charm has been getting to know his new digs. 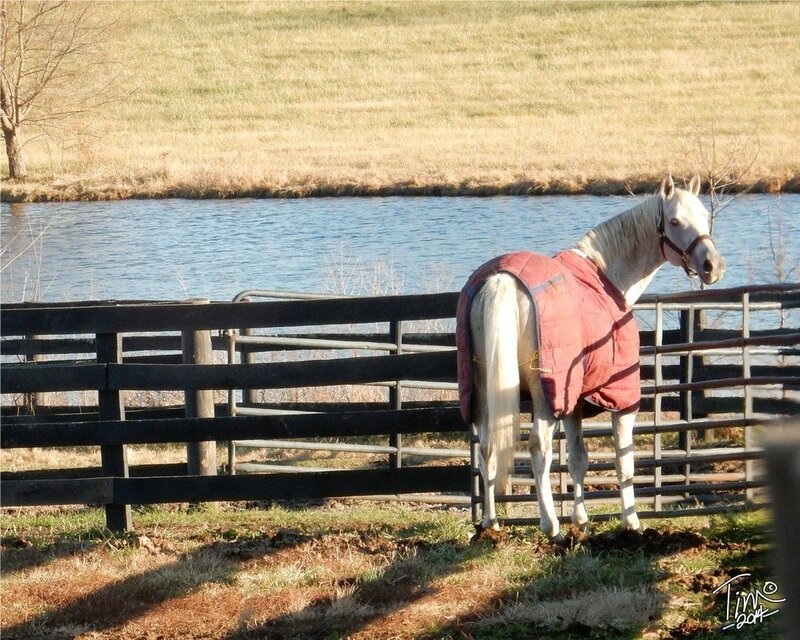 Silver Charm enjoys the lake view. Photo by Tim Wilson. 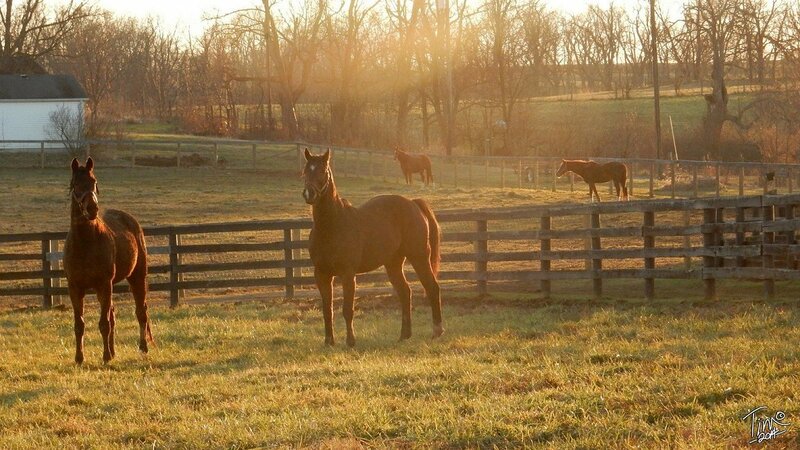 …and the view of Game On Dude in his paddock. Photo by Tim Wilson. What an interesting place this is! And who are all these new neighbors? Photo by Tim Wilson. 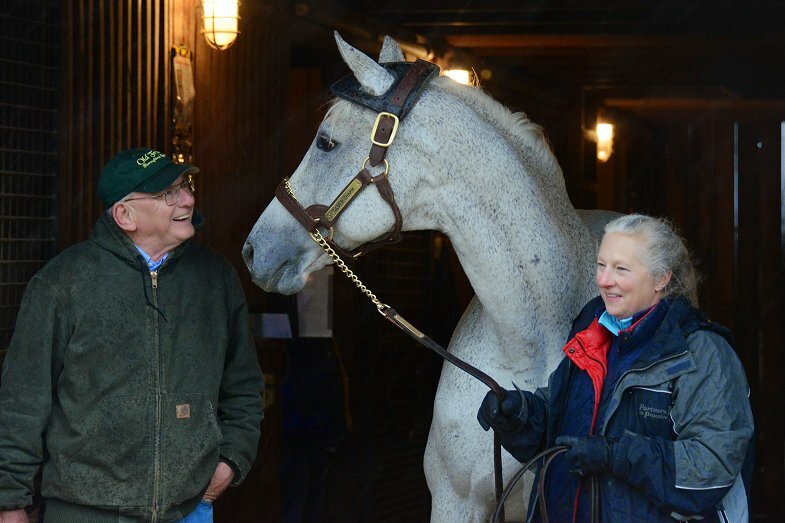 Of course, he’ll also ease into his new job visiting with his fans and playing whatever part he enjoys playing in Old Friends’ teamwork to enhance the general public’s appreciation for the accomplishments of race horses, the care deserved by all retired Thoroughbreds, and the wellbeing of all horses. While still in quarantine he’ll get to watch tours and get a sense of the routine. 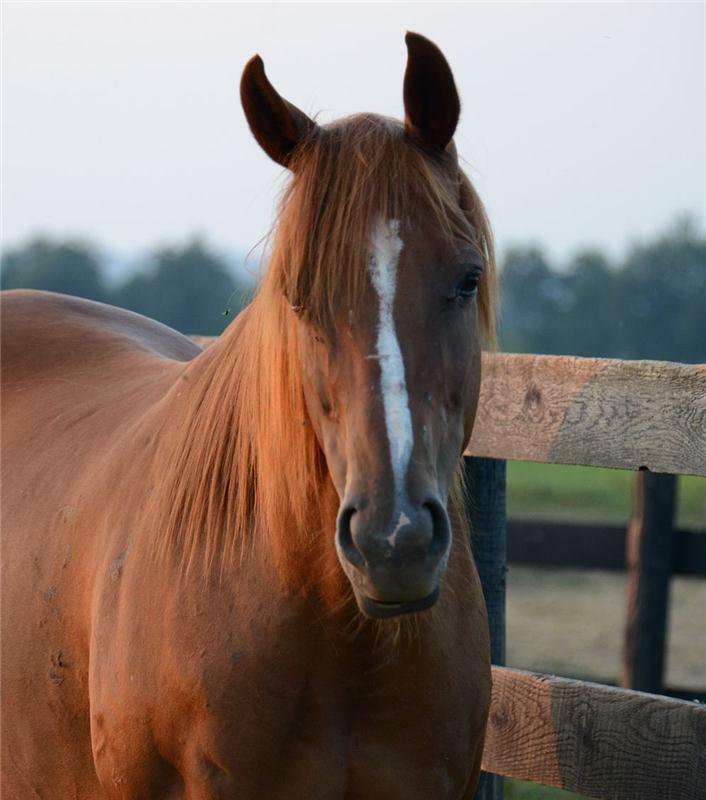 Importing a stallion from overseas includes some additional tests required by the Federal government, so it’s hard to say exactly when his quarantine will be over, but by that time no doubt he’ll have noticed the carrot aspect of his fellow residents’ job. As for meeting, greeting, and being the star he is, he’s clearly already a total expert at all that. We’re already in love with his beautiful guy and look forward to every step of what we hope and trust will be his long and fun retirement. It’s nice to come to a place where you have fans. Photo by Laura Battles. The other new development that has us tickled pink is how well the two newest paddock mates on the farm, Rail Trip and Catlaunch, are hitting it off. They’re just about inseparable, playing together, grazing together, and hanging out together, in the paddock behind Gulch’s. Mixed Pleasure has moved to the lakeside paddock across from Afternoon Deelites and is forming a friendship over the fence with Geri in the neighboring paddock. Rail Trip and Catlaunch on their first day together. That’s Geronimo and Sea Native in the background. Photo by Tim Wilson. 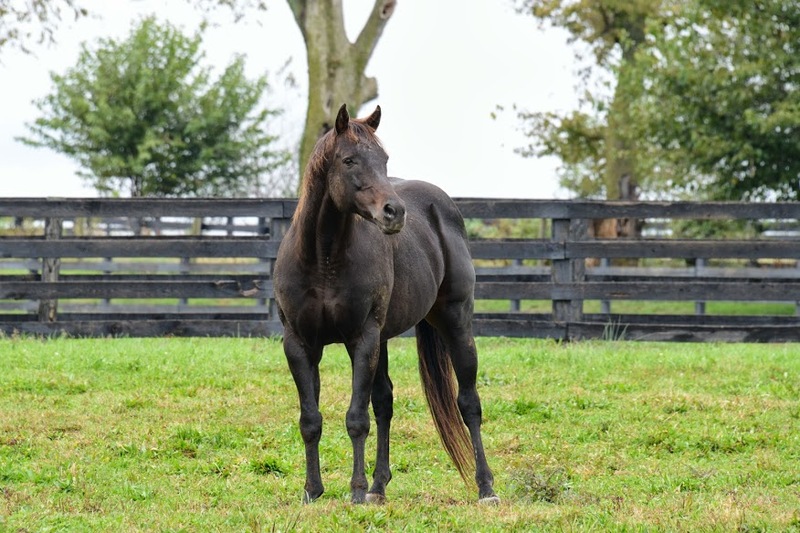 Though Rail Trip was a national star based in California and Catlaunch ruled Ohio racing, the two geldings probably have plenty in common, both being millionaires and all. 2010 Breeders’ Cup Marathon winner Eldaafer still prefers his goats. Eldaafer and Google. Photo by Laura Battles. Dinner time play. Escapedfromnewyork, Marshall Rooster, Fabulous Strike and Commentator. Photo by Laura Battles. From all of them to all of you, the very merriest of Christmases!